Am 22. und 23. November organisierte das IEP in Zusammenarbeit mit der Trans European Policy Studies Association (TEPSA) und der VolkswagenStiftung eine Expertenkonferenz zum Thema „The EU, Russia and Eastern Europe – Dissenting views on security, stability and partnership?“, die in der Vertretung des Saarlandes beim Bund in Berlin stattfand. Die Konferenz, an der internationale Experten aus Politik und Wissenschaft teilnahmen, war zugleich die Abschlussveranstaltung des Study Programme on European Security (SPES). 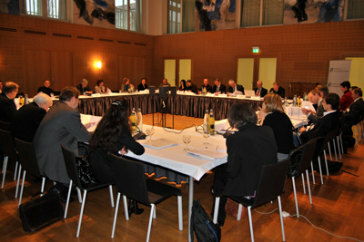 Forty participants – among them international experts from academia and the policy-making community – gathered at the Representation of the Saarland to the Federation to discuss three different, though interrelated topics: the issue of the ‘shared neighbourhood’ in the EU-Russia relations, the future of the European Neighbourhood Policy (ENP) and the security dimension of EU external action in the (South) Eastern neighbourhood. The EU-Russia relations in the light of the ‘common neighbourhood’ was the first topic under discussion. The review of possibilities for political cooperation between the EU and Russia in the post-Soviet space crystallized diverging positions on possible policy fields, tools and relevant actors (EU institutions, member states, economic or societal actors). The second panel aimed at discussing and evaluating the impact of the European Neighbourhood Policy (ENP) and the Eastern Partnership (EaP). While both achievements and limits were highlighted, the discussion focused on the (theoretical, practical and psychological) impact of membership conditionality. In the third panel participants discussed institutional developments of the EU’s Common Security and Defence Policy (CSDP). Moreover, the policy was analysed from a regional perspective (i.e. implications for the Balkans) as well as around analytical lenses (i.e. long-term processes that are external to actors’ policy decisions). Finally, a dinner debate with Borys Tarasyuk, former Foreign Minister of Ukraine, focussed on the state of affairs of the EU-Ukraine relations, reasons for the failure of the Orange Revolution, and Ukraine’s positioning between the EU and Russia.